Many people are using Cisco routers for P25 linking via the serial WIC cards. If your router can deal with voice hardware, then it is possible to use E&M cards to link with other mixed mode Quantars or analog repeaters, using the same router. This PDF from Cisco gives you an overview about the necessary hardware, in short you need a router that can accept voice hardware, then depending on the router either a voice network module or a DSP module and a VIC E&M card. Also make sure that the IOS feature set running on the router can do both voice (LMR) and STUN. We use 2600XM series, 2801 and 2811 for example. E&M Type II interface model is used in our case, if you look at the E&M cards RJ45, pin 1 is left and pin 8 right, the TX and RX Audio pins 6&3 and 5&4 are connected to the Quantars orange analog audio connector at the back. PTT is connected to the 50 pin Telco connector, E&M pin 8 goes to 7 on the Telco and E&M pin 7 is connected to 11 (AUX 1) on the Telco. E&M 1&2 are not used, we use VAD Ciscos voice activity detection. On the Quantar we need to configure a wildcard, first define AUX 1 to be active low, and then set up a wildcard entry that keys from WL when AUX 1 is low (active). 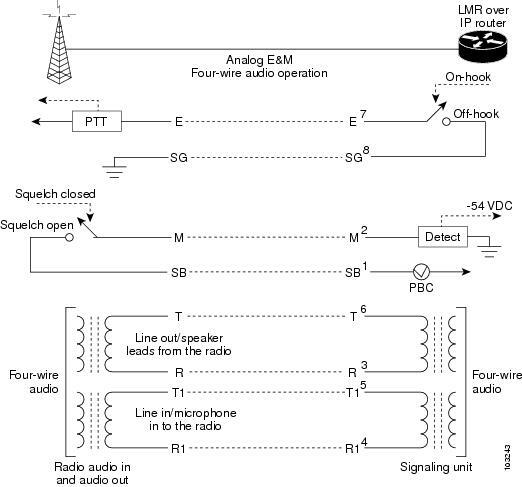 This is only to show what is needed to pass analog wire line audio to the transmitter, you can setup more wildcard tables so that analog and digital not interfere. A little bit creativity is needed here to find the best solution for your needs. If you are using a Astro-TAC 3000 for mixed mode linking, then you don’t need the PTT cable and wildcard entry, the station will be keyed via the V.24 interface, even for analog transmissions. The bootup e-lead off and lmr led-on will not work on the 2600XM series, leave it out, it will work just fine, the downside is that the repeater or transceiver will be keyed up during the routers boot period. You can see how the 100/101 interrelate on both routers, so if you use the second voice port, you can configure more dial peers using 102/103 and port 1/0/1 insted of 1/0/0. The destination-pattern numbers are not important you can use everything as long as you have a matching pair. This setup is a one to one thing, perfectly fine if you use is with a voter or if you only need one link to a distant location. It is also possible to use Multicast, this way you can have multiple destinations and also tie in Cisco phones or listen in via PC for example. I will add Multi cast info as soon as possible.